Place the range extender within the range of your router's Wi-Fi. Connect the extender to a power source and wait for the light on top of the extender to turn solid. NOTE: For initial setup, you may need to set it up closer to the router. For example, you can set it up in the same room as the router and once the extender is configured, you can then move it to the desired location. On a computer, smartphone, or tablet, connect to the Wi-Fi network name of the extender called Linksys Extender Setup. This is the default wireless name of the extender. Be sure that you have at least 50% of your router’s Wi-Fi signal on the device you will use for setup. NOTE: If the range extender is not broadcasting its wireless network name (SSID), click here to learn how to resolve this. Open a web browser on your computer, smartphone or tablet and access the Linksys RE3000W v2’s web-based setup page by entering “http://extender.linksys.com” or “192.168.1.1” in the Address bar. 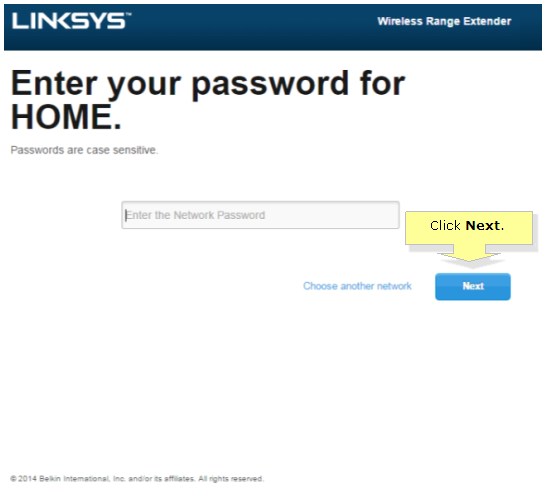 Once the Linksys Wireless Range Extender screen appears, click Start. On the License Agreement screen, click I agree. It will now search for available wireless networks. Select your wireless network name or SSID. NOTE: In the image below, HOME is used as an example. NOTE: If it notifies you that the range extender is placed too close to your router, you can either click Connect anyway to continue or click Find better location to find the right spot between the router and the area to which you want to extend your network. Enter the password of your wireless network in the blank field. Then, click Next to connect to your network. After successfully connecting to your router’s wireless network, you will see a confirmation message saying, Your extender is now configured. You should now be able to connect to your network. If you want to learn how to successfully connect wireless computers to your network, click here. NOTE: Once your extender has connected to your network, it will obtain an IP Address from your existing DHCP server (usually your existing wireless router). To lookup the new IP Address, check your router’s DHCP table. For more details, click here or if you want to check through the Linksys cloud account, click here.